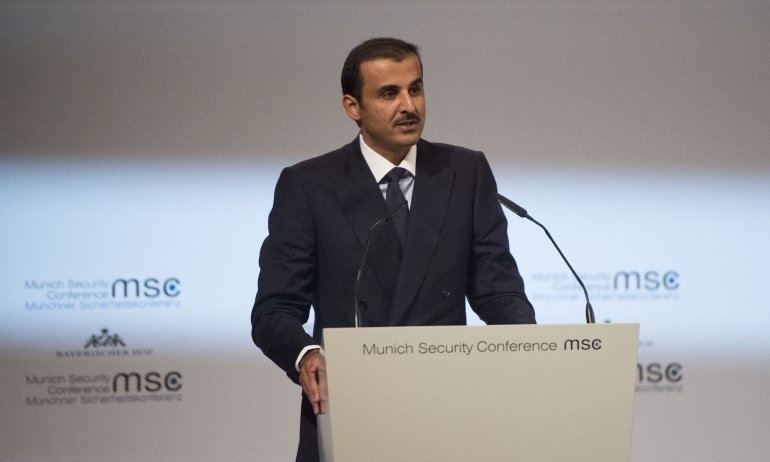 HH the Emir Sheikh Tamim bin Hamad Al-Thani delivering a speech in the opening session of the Munich Security Conference. HH the Emir Sheikh Tamim bin Hamad Al-Thani participated Friday in the opening session of Munich Security Conference, which takes place in the city of Munich in the Federal Republic of Germany in the presence of a number of Their Excellencies leaders of states and governments and heads of participant delegations. HH the Emir Sheikh Tamim bin Hamad Al-Thani then delivered a speech in the opening session of the Munich Security Conference. It gives me great pleasure to address this distinguished audience. Germany is an especially appropriate venue for a meeting to discuss the present-day global order, and the threats to it. A nation that stands for the values of freedom and the rule of law, Germany is also a major pillar for the European Union, seen by many as a bastion of coexistence and trans-national cooperation. While all of us are aware of the challenges facing the European Union, we in the Middle East and Im sure this is true elsewhere see the EU as proving that peaceful coexistence and collective prosperity are possible in the aftermath of horrific conflicts. As a body, the EU demonstrates that a union can establish shared security based on mutual interests, even amongst people who tore themselves apart in war. Like it or not, Brexit is an example of a peaceful resolution of differences. No diplomatic ties were cut, and no blood was shed. There is a lesson here for us in the Arab region. The European Union provides a framework for regional governance, and the peaceful arbitration of disputes. This framework is sorely needed in the Middle East. Today, many governments and international powers act with impunity, without regard for human rights. The lack of accountability for good governance is widespread. It's no wonder that people are losing hope individuals who would otherwise have stood trial for war crimes against their own people are possible candidates in presidential elections! An audience such as yourselves must be able to see why many people, even entire nations, are losing faith in international accountability. They think arguably right that many of the global mechanisms for conflict resolution, and the maintenance of rights have been paralyzed and sidelined. Palestinians since the Nakba, seventy years ago; the situation in Syria, Libya, Somalia, Afghanistan and Yemen. The suffering of people in my region may appear distant to an audience in Munich, but the waves of refugees make these injustices a European concern. And the darkness of terrorism now casts a shadow on the entire world. Suffering and injustice pave the way for terrorism to flourish. Evil actors will twist religious dogmas to poison the minds of desperate people. Extremist religious doctrines pose an undeniable challenge to all of us. They exist in every culture, and the Islam has no monopoly on them. It is clear that we are obliged to combat religious extremism. But, having said that, attributing violent terrorism to extremist ideologies is too simplistic. It does not explain why violent extremism has become a major threat in my region, while extremist ideologies can be found anywhere.